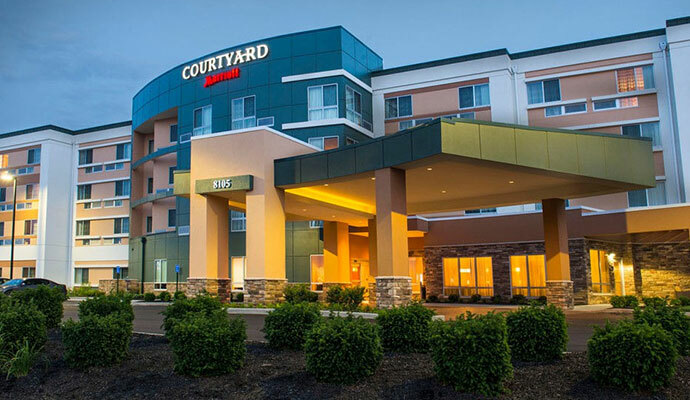 Courtyard by Marriott Evansville is a 119-room state-of-the-art hotel, located just off of I-69 at the Lloyd Expressway in Evansville, Indiana. Courtyard is proximate to downtown Evansville, which is the largest city in the region and the third largest in the state of Indiana. The Courtyard includes free Wi-Fi, a fitness center and an indoor pool, and 2 meeting rooms that feature 1,614 square feet of total event space. Also on site is The Bistro, a restaurant that serves breakfast and Starbucks Coffee for guests in the morning, as well as drinks and dinner in the evening. Courtyard Evansville East is a comfortable, productive place to stay for both business and leisure guests.